Cantitatea minima pentru "Knucklehead Jr. 10cm/17.7gr" este 1. Este o naluca topwater revolutionara, un popper articulat care produce sunete si turbulente spectaculoase, cu o miscare a corpului absolut unica! 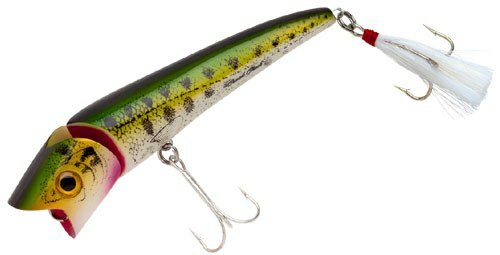 The Creek Chub Knuckle-Head Jr. is a unique jointed topwater lure that produces sound, surface disturbance and a totally unique body motion. The patent-pending Hold-Tite link between the head and the body provides a strong link and allows the body to swim while the concave mouth produces a popping/chugging surface display. The Creek Chub Knuckle-Head Jr. topwater features a cupped mouth that pops and chugs, while the body of this slender minnow-profile bait sashays back and forth. The key is the patent-pending Hold-Tite link between the head and body. This super-strong link allows the body to move and provides an injured-gill look.